According to a recent press release from John Deere and Company, the John Deere Foundation has tentatively agreed to sell the property that used to be home to the John Deere Collectors’ Center, in an effort to open the space for further development in downtown Moline, Illinois. The Collectors’ Center, which was a tourist attraction that hosted antique tractor displays and auction events up until its closing in 2008, will be razed and prepared for new development at a January 14th Moline City Council meeting. Mara Sovey, president of the John Deere Foundation, said about the pending sale in the company release, "We believe this action will be beneficial to the Quad City community. We are confident the site will be placed back into use to strengthen community development in downtown Moline." 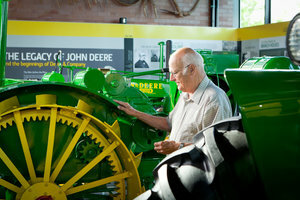 The site was in operation for seven years as a center for collectors and as an attraction for John Deere enthusiasts prior to its closing in 2008 as part of a consolidation effort in downtown Moline. According to Sovey, there have been several potential buyers of the property since its doors were shut. The building did not qualify for the National Register of Historical Places, but the John Deere Foundation is aiming to preserve any historically-significant components of the structure. Several buyers will likely be interested in this space as the John Deere Foundation has agreed to open the space for further growth in downtown Moline.